Step right outside for snow shoeing or cross country skiing! This beautifully appointed cabin offers comfort and serenity tucked into a little nook in the hills of Barnard VT. The property abuts the acclaimed property of Twin Farms. A wood stove, gas fireplace, spiral staircase, loft and catherdral ceiling contribute to the instantanious sense of warmth and relaxation. Recent rennovations, fresh paint and furnishings selected by interior desiner make for cozy surroundings. Words can not describe the sense of calm that will overcome you as you relax to the sound of the bubbling waterfall and creek just outside the front door. Lounge chairs situated on the large porch offer you the perfect place to enjoy amazing views of the pond, waterfall and mountains. A classic double hammock offers the perfect place to enjoy a book or nap. This private property offers the best of both worlds with proximity to conveniences of shops and restaurants. Just a few minutes away are Silver Lake, The Barnard Country Store, The Barnard Inn, Suicide Six and the town of Woodstock. Close enough for commuting to Hanover, Vermont Law School and Dartmouth. We love to travel within the US and abroad, often using VRBO for our own travel bookings, most recently in the Exumas. We are an active family, enjoying the many things to do in the great outdoors of the Woodstock/Barnard area. Skiing, snowshoeing, hiking, horseback riding and swimming are among our favorites. My husband grew up in Woodstock and we couldn't imagine a better place to escape from our busy life in Boston. His parents live at the property next door and are the caretakers of the cabin, ensuring all your needs are met. We got engaged here on the top of Mt. Tom and have created many priceless memories in this idyllic setting. There is a small sandy beach area at the swimmable pond on the property. Pond on property with beach area and canoe. Thermostat for heating via automatic gas stove. Wood fireplace also. I- pod/ i-phone docking station with speakers. Large porch with chairs and seating for four for dining and relaxing. The porch overlooks pond/waterfall and double hammock. 'sugar shack' by pond equipped with a variety of chairs/floats/waterwings/bugspray etc. Minutes from Suicide Six 1/2 hour from Killington Walk out to snow shoe or XC ski! located on a hillside with multiple steps. Spiral staircase up to bedrooms. 2 steps down into kitchen. Wonderful Vermont cabin experience. Just the basics, but executed just right. Good kitchen, cozy living area, roomy enough bedrooms. Great property, nice family. Highly recommended. The cabin is remote and located on a beautiful piece of property. The living and kitchen offer good space, but the sleeping quarters are tight with small beds not really made to accommodate 2 adults. The home, linens and furniture smell quite musty, and there is a bit of a mouse problem as per droppings. Spiral stair case was a bit of a challenge. Not worth the amount charged per night. No one in our party stated they would stay here again. This cabin is tucked away off a dirt road on a large property, offering great privacy. The babbling of the adjacent waterfall is lovely and can be constantly heard in the background. The pond is large enough to swim laps. It is very well appointed with comfortable and clean furnishings. Lamps near some of the sitting areas would have been helpful for reading. The kitchen is large. The only down side was the upstairs. Difficult to get large suitcases up the narrow spiral staircase and due to the sloping roof, there is little head room in the bedrooms. Nonetheless, had an enjoyable stay. If your looking to get away, this beautiful cabin tucked into the hills is just what you need and with no cell service it really helps you unplug! The private pond and fire pit really made our girls happy! The porch with the table, chairs and gas grill was my favorite place to be. Eating our meals out there next to the stream falling over the rocks was absolute priceless. The cabin was perfectly big enough for our family of 4 and was very charming. The cabin it self was stocked and very cleaned and the washer and dryer is every mothers dream! I was a nice get away from our busy life. Our family (2 adults, 2 kids under 8) really enjoyed our 4-day stay here. The location can't be beaten: close to Woodstock and Waterbury, but you feel as though you are in the middle of nowhere. There is so much do at the house (pond, boats, fire pit, sandy beach) that my kids would have been happy staying at the cottage. The actual cottage is clean, well-maintained, and cozy. We came home feeling refreshed! (don't forget the bug spray). This is the perfect place to get away! 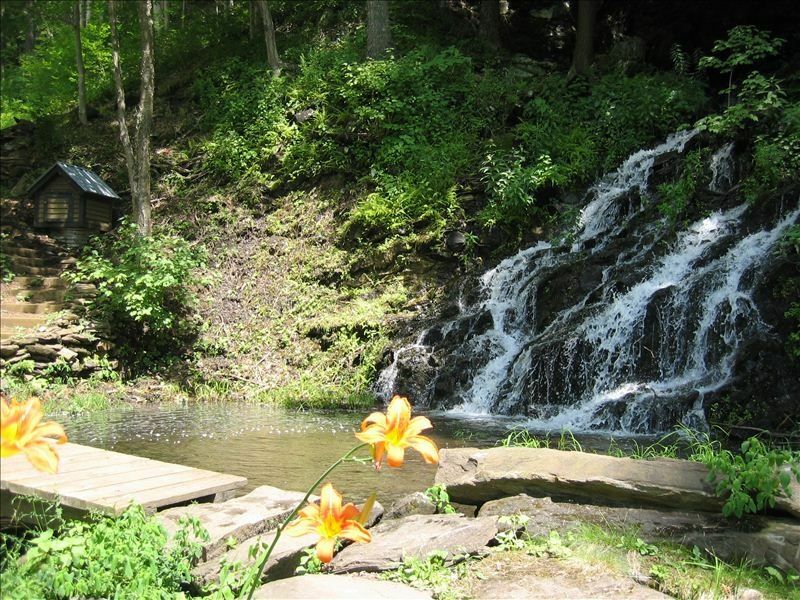 Great location... peaceful and private with an amazing waterfall. The cabin is well stocked and extremely clean and well cared for. THE ACTUAL ADDRESS IS 16 TURKEY HOLLOW LANE. this is located off of Lime Pond Road. It is a private dirt road. Turn into the driveway (Turkey Hollow Lane) and bear right down diveway and cabin is set back up the hill to the right of our pond. If you pass Lime Pond on your Right you have gone a little too far if you are coming from Woodstock. Within several miles of Suicide Six ski area and accessible to Killington. Just a short ride into Woodstock, VT. Located in proximity to Vermont Law School, Hanover and Dartmouth.